These perfect shining spheres have added elements of elegance and grandeur to each one's life who proudly owns it. How would you replace Her Majesty’s three stranded necklace of family pearls with any fortune? Of course not, because pearls are gems that hold on to making its own league of fashion statement. Pearl is a gemstone that is truly and purely organic in nature. The best-loved gems of all the time, pearl pendant has their place reserved in every aspiring jewellery lover’s closet. Pearl have the popular existence in the hues of cream and white but you can certainly find them in almost every hue. This June birthstone is considered as pristine as diamonds, rubies and other emeralds all account to the sheen and elegance it manifests. Known to carry several healing properties, pearls are forever and ever. Pearl pendants have emerged to be widely gifted pearl jewellery because of its indispensable beauty and allure that entices the wearer and the one who watches it. The pendant set with silver, gold or platinum metals and having some intricate detailing are all the rage. Such a gem we must say that also inhibits purity, charity, integrity, truth and loyalty to the wearer. Looking for something unique and offbeat, a Tahitian pearl would end your search. 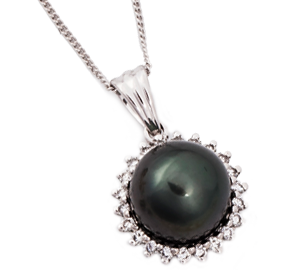 Tahitian pearl is an organic gem that is extracted from the black lip oyster. At TJC, we ensure to make use of high-quality Tahitian pearls to exhibit the ethereal beauty to the jewellery. The gorgeous assemblage of pendants comes with a chain set in precious metals and silver/gold/platinum overlay. Coming to the wide array of pearl pendants we see, a pearl and diamond pendant calls for an eternal symbol. As they say, diamonds are forever, pearls are forever and ever!! So, this combination should just be a classic heirloom in your jewellery treasure trove. The fine and exquisite diamond and pearl pendants are finely curated to explicitly define what a marvel of jewellery so formed. Embrace your love for pearls with some surreal pieces available only at TJC! !